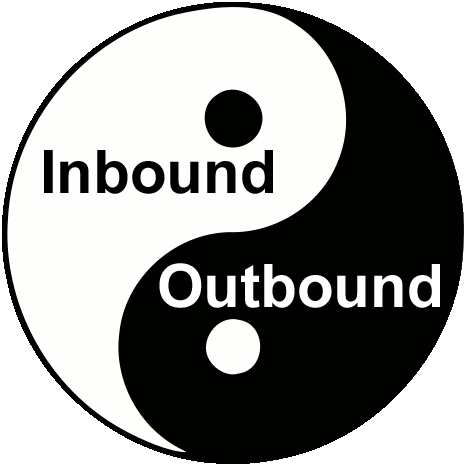 I read a blog recently that noted at a basic level, inbound marketing is unpaid, outbound marketing is paid. I understand that it was a high level statement, but even then, that characterization is misleading. The difference between SEO and PPC alone make that invalid, but I understand the basis from where that simplicity came. Inbound marketing is giving people reason to come to you, typically for information. Outbound marketing is letting people know that’s there. So the offer is the inbound, the postcard telling you it’s there is outbound. Outbound is the PPC spend getting you to the landing page, inbound is the PPC text ad and the landing page itself. The two approaches, when done properly should become integrated, which is great, but now as marketers it seems we have to bucket it to fit it into different job descriptions and “solutions-based offerings” we provide our clients. So much of outbound marketing is really inbound as well, because while we “put it out there”, it’s still up to the customers to determine if they are interested — much like the spam or trash buttons in our email, will our direct mail piece make it into the house, or get dropped in the recycle bin without a second glance. The lines are getting re-blurred, which in my opinion is the best. This requires us to focus on the customer even more, to determine across all channels the context of our content, and to fine tune, segment, and truly target those audiences appropriately. Are you finding the line between inbound and outbound marketing getting blurred? Is there more of a push or a pull in your approach?